This is two coats of Revlon Royal and one thin coat of Essie Shine of the Times. Royal is a bright true blue. I probably would have been better off with three coats as it was still a little transparent, but only in bright sunlight. Shine of the times is my first flakie and I'm hooked. It's a red flake that flashes green with a little yellow in the right conditions. I would like it better if the flakes were a little more sparse, but it's fun to wear in a can't-stop-looking-at-my-nails kind of way. I understand it's very similar to (if not a dupe of) Nubar 2010, so I may pick that one up at some point to compare the two. I've been infatuated with matte topcoats lately, particularly over glitter or flakies. This one is Essie Matte About You and is the only one I currently own, but it works so well I don't think I'll bother with anything else. I've been seeing the 31 Day Nail Art Challenge all over the place, so I've decided to give it a go. 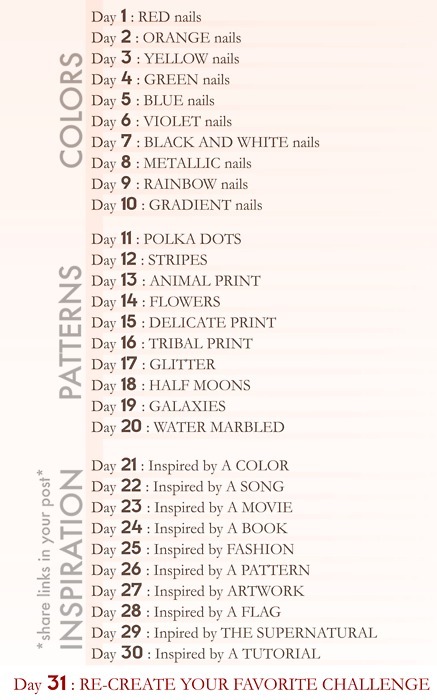 I'll be kind of cheating, though, since I have neither the time nor the inclination to do 31 designs in 31 days. 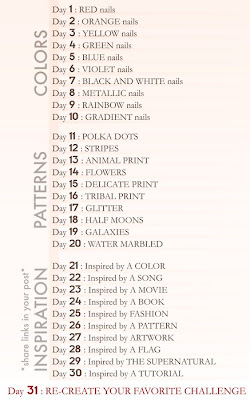 Mine will be more of a 31 Designs Bi-weekly-ish Challenge. Mostly I just want to improve my nail art skillz and exercise my brain meats.